Schrödingers katt (that’s Schrödinger’s cat in Norwegian!) 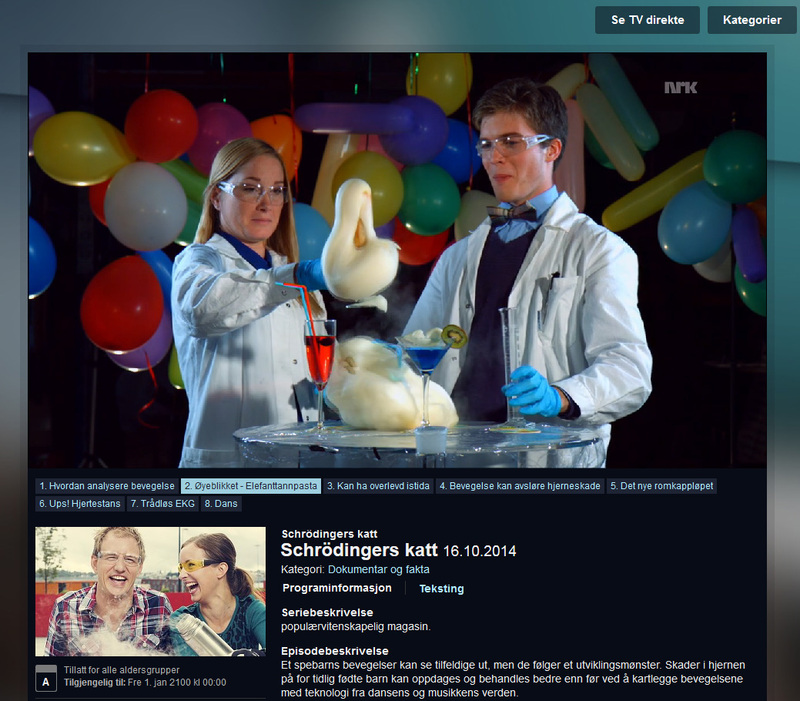 is a popular science show that runs every Thursday in prime time (19:45–20:15) on NRK1. It has been running since 1996 and has around half a million viewers every week. This fall season, the two of us got the opportunity to feature in the show, in a series of short segments where we show off flashy-looking chemistry experiments to each other. Every week, the program features a short segment called “Øyeblikket” (The moment). This usually consists of footage of something that happens quickly, but filmed with a high-speed camera and shown in super slow motion. 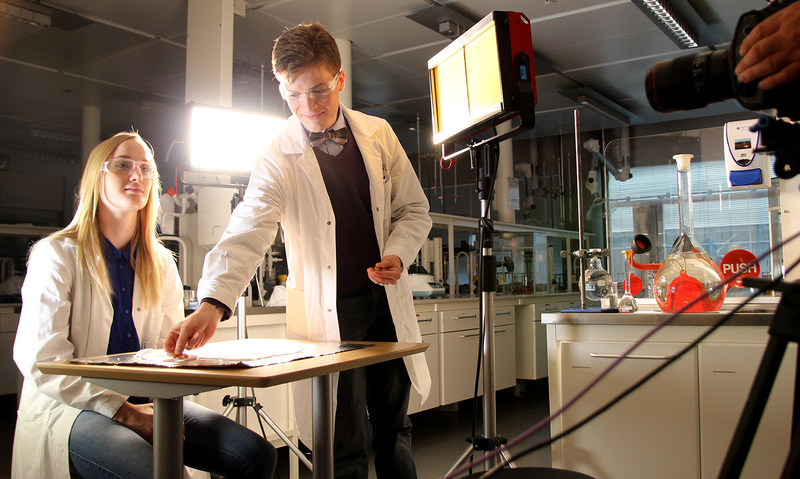 The idea to do chemical reactions came from Eldrid, one of the show’s presenters, who is herself a graduate of NTNU’s Chemical Engineering and Biotechnology program. She contacted the Department of Materials Science and Engineering, which is responsible for lab courses in general chemistry, and the task finally ended up on our desk due to our experience as teaching assistants. There are certain things in life you just cannot say no to, and we immediately felt that this was such an opportunity! We planned the experiments over a few telephone conversations, and initially settled on the three first experiments described below: Hot ice, the copper crystal, and golden rain; which are nice-looking reactions sharing the common theme of crystallization. The two of us spent a couple of days preparing and testing the reactions, while the show’s producers came up with a production plan where chemistry would be wrapped in a framework story about a boy and a girl trying to impress each other in the lab. Filming of the first three experiments was done over the course of three days, and done entirely on location in one of the general chemistry student labs in the Natural Science building. We were extremely impressed with the cameraman’s ability to turn the familiar lab into something which could almost have been a scene from a C.S.I. episode. The price to pay for the nice footage was that everything took extremely long time: Not only did most scenes require a number of takes to get the perfect splash, swirl, smile or wink of the eye; but in addition, many scenes had to be shot from multiple angles, requiring movement of camera equipment and actors between takes. Quality takes time! 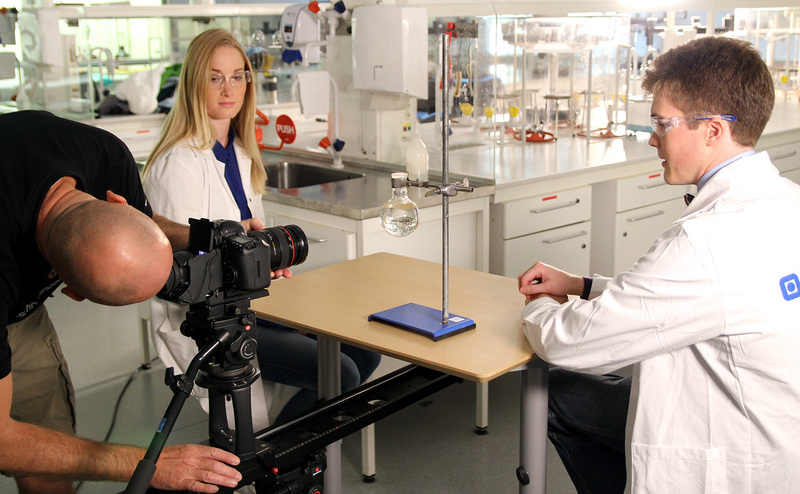 The final three experiments were not filmed at NTNU, but at NRK’s premises at Tyholt. We brought chemicals and equipment with us, and spent another three days shooting video footage for the elephant toothpaste, nitrogen triiodide and mist bubble experiments. At times, the producers were slightly concerned about getting everything done in time, and on the second-to-last day of filming, we worked a total of 12 hours from morning to night. Spirits were high, though, among other things due to the consumption of copious amounts of coffee and cameraman Roger constantly joking in mock-trøndersk (a take on the local dialect). We finally managed to capture all the desired explosions and eruptions on film, and finished just in time on the last day of filming. 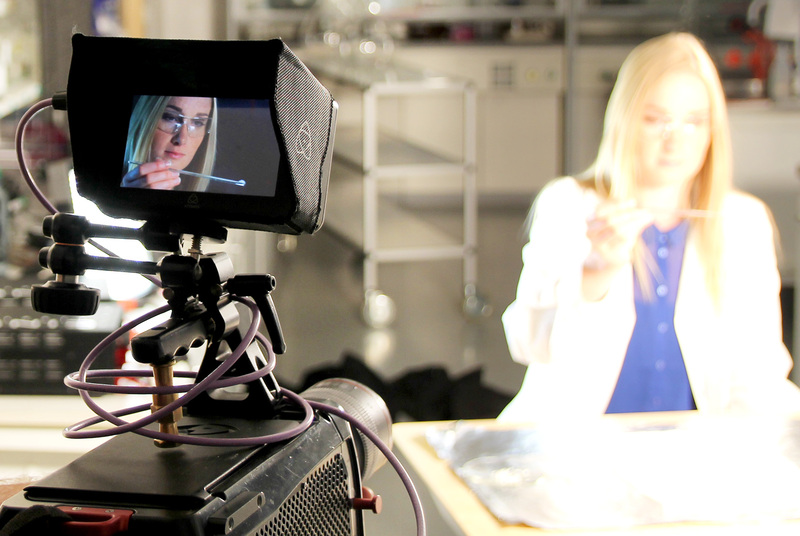 For two PhD candidates who take an interest in scientific communication and outreach, it was an incredibly fun experience to see the production side of a popular science show. It definitely gave us a taste for more such activities, but we’ll do our best to find time for doing research, too. 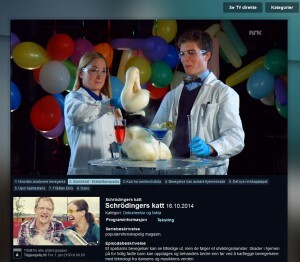 Remember to watch Schrödingers katt! Every Thursday on NRK1 from 19:45 to 20:15.